This surreal scene unfolded as a tiny group of activists entered the fair's exhibition space, which contained a number of Israeli arms industry exporters. Armed with nothing but "Boycott Israeli apartheid" t-shirts and keffiyas, they first held a picket outside the entrance, during which a large Palestinian flag was held up along with signs that read, "Israeli arms embargo now!" and "President Dilma, stop buying Israeli weapons!" Dilma Vana Rousseff, the first female president of Brazil and a member of the Workers' Party, is the successor to President Luiz Inácio Lula da Silva. This first demand--to embargo Israeli arms--is the central aim of the Brazilian boycott, divestment and sanctions (BDS) campaign led by the Frente em Defesa do Povo Palestino-SP (Front in Defense of the Palestinian People--São Paulo), which is composed of dozens of Brazil's civil society organizations. The second--calling on President Dilma to halt the purchase of Israeli weaponry--is a condemnation of the rapid increase in military contracts between Israel and Brazil, which has solidified Brazil's shameful standing as one of the five largest importers of arms from the apartheid regime. Both the São José dos Campos Steelworkers Union and the Brazilian labor federation, CSP-Conlutas, are endorsers of this demand. These two organizations joined the demonstration in front of RioCentro, which also included representatives from Anel (National Free Students Assembly), Mopat (Palestinian Movement for All), Ciranda Internacional da Communicação Independente (Ciranda International for Independent/Shared Information) and PSTU (Unified Socialist Workers Party). 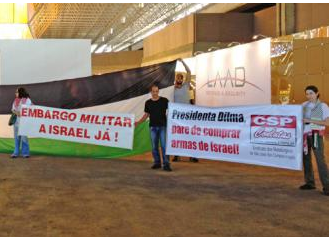 This year's LAAD fair demonstrated the urgent need to end the military agreements linking Brazil and Israel. The more than 30 Israeli companies present at RioCentro were granted special privileges to dialogue at the event's opening ceremony with Brazilian Vice President Michel Temer and Secretary of Defense Celso Amorim as official representatives of President Dilma Rousseff. Exhibitors' sights were set on acquisition of security contracts for the 2014 World Cup and the 2016 Olympics, both of which are set to occur in Brazil. Following the initial demand for passports, Israeli security guards surrounded the activists, serving as an alarming example of Israel's ability to place itself above international law. The exercise of such impunity also offers a tiny glimpse of what life must be like for Palestinians living under occupation and apartheid. In addition to demanding passports from Brazilian citizens exercising their rights on their own soil, the security agents then proceeded to follow the activists as they moved throughout the fair. There were dozens of Israeli personnel. The activists verbally protested this discriminatory act while simultaneously denouncing the occupation of Palestinian land. For those who have been to Palestine, it was as though the Israeli guards had reproduced, inside of Brazil, their system of segregating and expelling the "unwanted." The demand for passports seemed an attempt to recreate a West Bank checkpoint with which the Israeli security personnel were no doubt familiar. It was as though, with the blessing of the Brazilian state and federal governments, they had staged an occupation of the LAAD event area and were completely ignoring Brazilian citizens' democratic right to free expression and assembly. DESPITE ATTEMPTS to embarrass and intimidate the "unwanted" visitors at the fair, the activists were still able to get a sense of the merchandise on display--such as the Israeli-made drones recently used during the Operation Pillar of Cloud attacks on Gaza last year. Israel's Secretary of Defense even had his own booth. For some reason, activists were not permitted to enter it. One particularly striking exhibit by Israeli Aerospace Industries (IAI) featured a futuristic presentation of its technologies on a giant screen. IAI, according to reports from Palestinian organizations, produces equipment used by Israeli occupation forces in their policing of the apartheid wall and illegal Jewish-only settlements. IAI's Brazilian subsidiary, Bedek, together with the Brazilian conglomerate Grupo Synergy have formed a joint venture called EAE Soluções Aeroespacias (EAE Aerospace Solutions). This conglomerate produces materiel for the Brazilian Armed Forces that utilizes TAP M&E Brazil's production and maintenance centers in Rio de Janeiro and Porto Alegre. Another exhibitor was Rafael Defence, which boasts on its website of a "special" relationship with the Israel Defense Force (IDF). This firm--in collaboration with Netcom Malam Team International, Israel's largest information technology group--has developed specially designed products for Israel's occupying forces. Israel Military Industries (IMI)--which counts Brazil's army among its clients and enjoys a commercial partnership with Taurus, which is headquartered in Porto Alegre--was also an exhibitor. IMI manufactures the Israeli Tavor rifle. The LAAD Fair was sponsored by Brazilian aviation manufacturer Embraer, a company closely linked to the Israeli arms industry. It maintains contracts with the Israeli company Elbit Systems, which was also a fair exhibitor. Elbit, a high-tech military firm, manufactures the aforementioned Israeli drones recently deployed in Gaza. Elbit is also one of 12 companies involved in the construction of the Israel's apartheid wall. In October 2012, UN Special Rapporteur on Palestinian Human Rights Richard Falk called for the boycotting of Elbit Systems during a UN General Assembly. Throughout the last 15 years, Elbit has maintained a presence in Brazil operates through its subsidiaries AEL, Periscope Optronic Equipment S/A and Ares Aerospace. Through Ares Aerospace, Elbit recently acquired two million-dollar contracts with the Brazilian army. Furthermore, the government of Rio Grande do Sul--the state that is home to Porto Alegre--plans to expand Elbit's presence in Brazil by means of privatization. If Brazil's supporters of neoliberalism have their way, Brazil's Porto Alegre could become Israel's most important foreign military research outpost because it is home to AEL, which is a subsidiary of Elbit. This project, financed by public money, also provides benefits in the form of business transactions intrinsically linked to Israel's crimes and violations of human rights. The BDS Brazil campaign has sent a letter to federal and state governments in Brazil expressing its alarm at Israel's presence at the LAAD Fair. Signed by more than 30 civil society organizations, the document highlights the importation of these military technologies by local governments to use in their repression of Brazil's poor black youth. The case of Rio de Janeiro is exemplary. The Israeli company, Global Shield, won a million-dollar contract to provide military police with eight new armored vehicles (known as caveirões in Portuguese) used in police occupations of the favelas (slums).